This scenario takes place at an isolated Antarctic research station. The Covenant of Antarctica has hurriedly evacuated the facility, but some of their advanced research remains. Several of the platforms have been booby trapped and the entire complex has been mined. Forces are made to 1,200 points with two players on each side. Sides will be randomly determined. There are no TAC cards used for this game and no side can use local air support. Initiative alternates between sides. The central research station and 3 oil platforms will be deployed around the centre of the table. These models count as size Large with an IR: 9, but otherwise have no statistics and cannot be targeted. Surface mines (value 4) will be placed around all approaches to this complex. One island will be placed near the main deployment zone of each side. There is no other terrain. 4x Event Cards will be used, these are summarised below. These are randomly shuffled and one is available to be captured on each structure of the complex (research station and oil rigs), secured when a non-tiny squadron within 4 inches, after they have moved, on the surface level rolls 3D6 and achieves two successes. Priceless Artefact: This card adds 250 victory points to your total. Valuable Resource: This card adds 100 victory points to your total. Energy Pulse: All Generators within 12" of this structure immediately go offline. 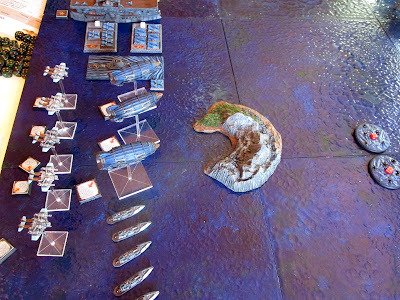 Rigged to Blow: All models on all surface heights within 9" of this structure immediately suffer a 9AD attack (rolled once and applied to all). This includes mines. The game will end in any turn after the Priceless Artefact has been recovered, when one side has also secured 50% of the enemy forces victory points (1,200 points). If the Priceless Artefact is recovered before one side has secured 50% then the game continues until one side has secured 50%, they are the winner. If both sides have secured 50% that turn, then the side which has secured the most Victory Points is the winner. After a random roll the Black Wolf and the Ottoman fleets were allied against the Prussian and Raj fleets (the latter also having a few HEC mercenary squadrons). 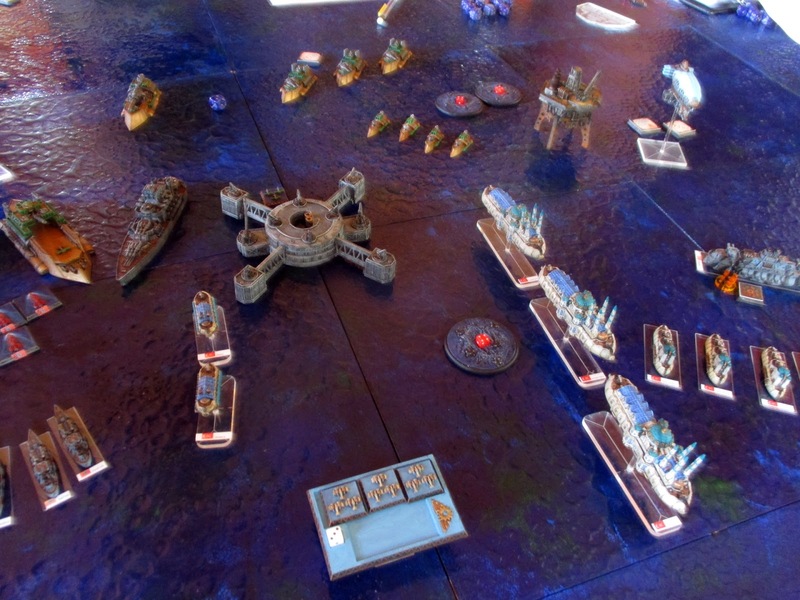 Both fleets deployed in reasonably compact fashion intent on seizing the central objectives. The Ottoman Kanuni Dreadnought, Mizrak Frigates and Sinop Monitor squadron were flanked by a Black Wolf Brigante Squadron, Death Bringer submarine on one side and a Manticore with attached Fury Frigates and enormous Death Bringer sky fortress on the other. 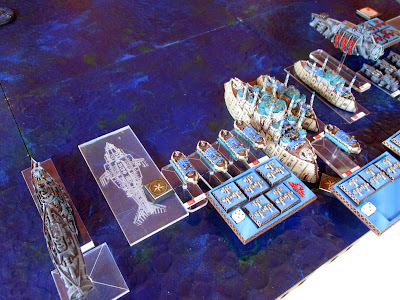 Opposing this was the bulk of the Prussian fleet, a mighty Elber carrier, lethal Sturmbringer submarine, Pflicht airships, Ulan cruisers and Saxony corvettes. The Indian Raj capital ships completed the armoured might of this strike force, contributing a Chanura heavy battleship, Jhasa assault carrier and Canda monitor. 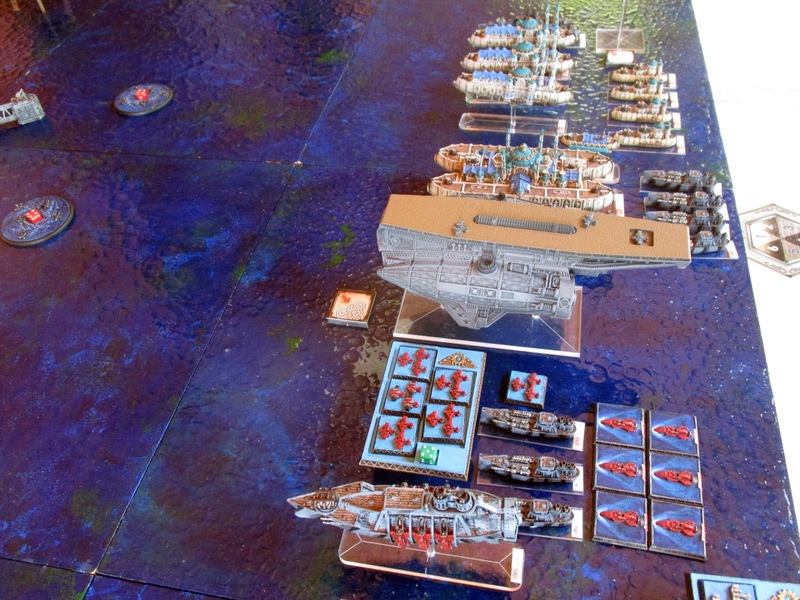 The force tasked with seizing the Research station for the Ottomans included a Sadrazam battleship, Fettah cruisers and Avci detroyers, supported by another Black Wolf Brigante squadron. 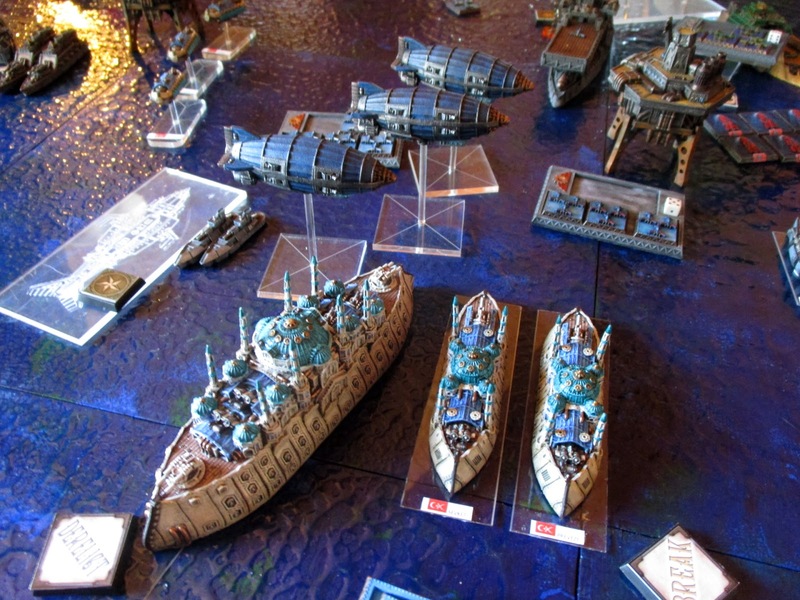 Opposing this were a squadron of Devak cruisers and Veran corvettes supported by a squadron of Phoenician airships hired from the Honourable Eclipse Company. 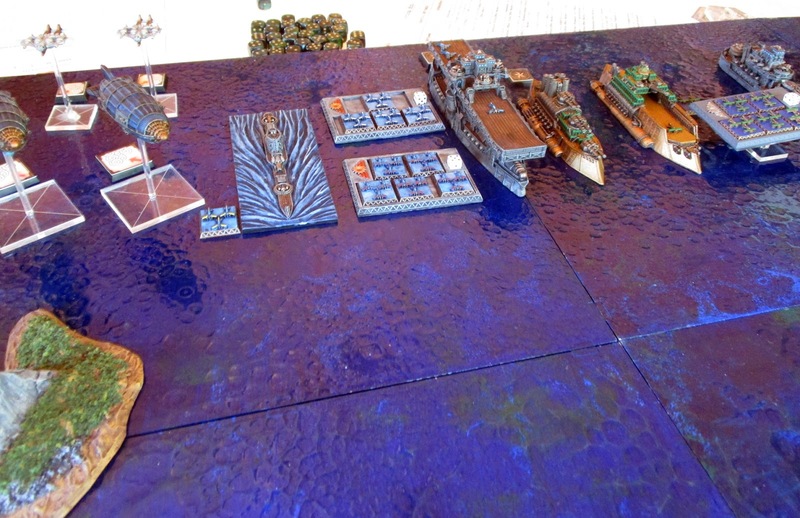 Additional Black Wolf reinforcements had been purchased by the Ottomans in the form of 3 Chimera airships (flanking forces due to arrive in turn 2). 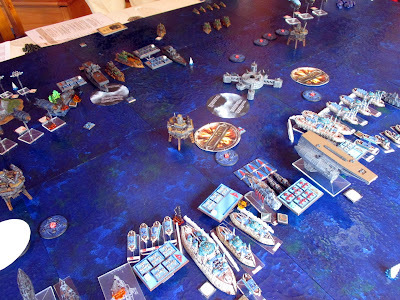 To counter this threat, the Raj dispatched a squadron of Hades interceptors to that flank. The battle began with the usual show of aerial acrobatics, as reconnaissance and fighters flew advance missions. However sudden storms generated by the Ottoman weather generators and Time Dilation fields, generated by the Black Wolf vessels meant that much of the early gunnery was to no effect. As the storm clouds closed in the Sturmbringer submarine unleashed its huge bombard, but an error with the gun casement meant the submarine was unable to dive beneath the surface swiftly, and it was raked with return fire, suffering serious damage. 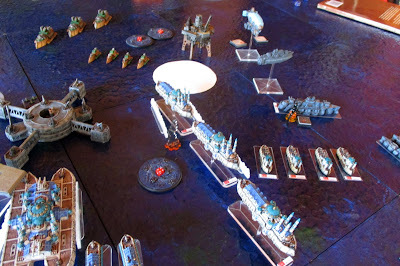 The Saxony corvette squadron boarded and searched an oil platform, triggering a massive energy pulse that put several Ottoman and Black Wolf generators offline. Crews hurriedly repaired these before the enemy could take advantage. 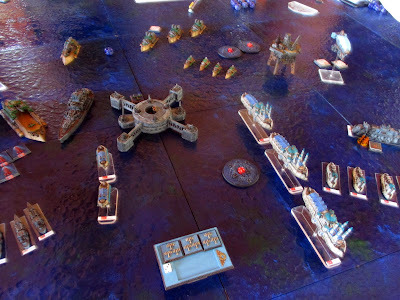 Although several ships suffered damage, no ships were actually sunk in the first turn due to all the weather and time effects, meaning no VPs were awarded! The Chimera airships arrived and were engaged at relatively close range by the Sturmbringer submarine, leaving one of the sleek airships nearly crippled. 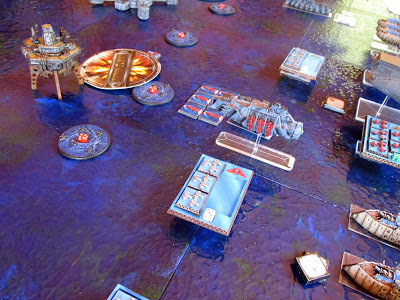 The Hades interceptors then engaged the Chimera sending one down in flames. In retaliation the Nemesis Battle Cruiser and accompanying Wraith airship destroyed several Saxony corvettes, and seriously damaged the Prussian Ulan cruisers. This brutal close-quarters gunnery turned into fierce hand to hand combat as marines from the Ulan swarmed over the Nemesis. The mercenary crew fought to the last man decimating the Prussians, but ultimately the battle cruiser was prized by the Prussian Empire. Meanwhile the Raj used their Time Flow Generator to rapidly close with the enemy. The Chanura and Elbe (both flagships of their respective fleets) surged forward scoring several hits at close range on the Sadrazam battleship and Manticore skimmer. Such bravery came at a high cost as return fire damaged both ships. 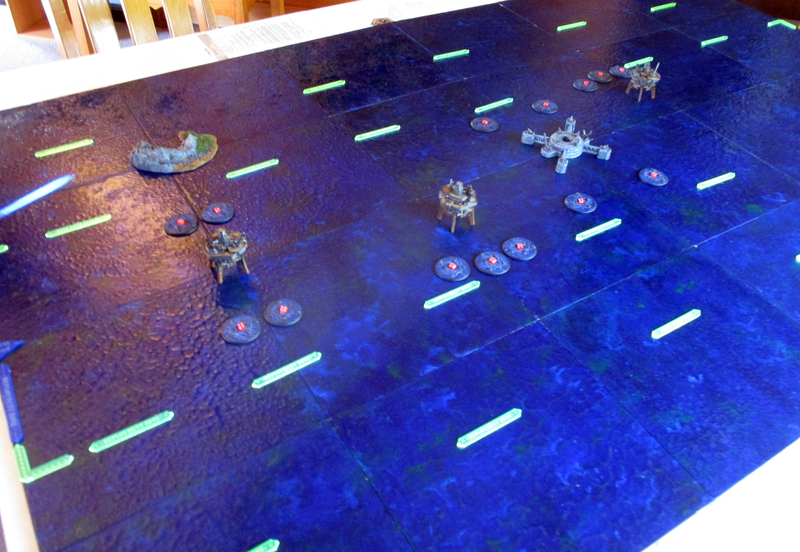 On the flank a squadron of Veran corvettes boarded an oil platform and recovered a valuable resource. 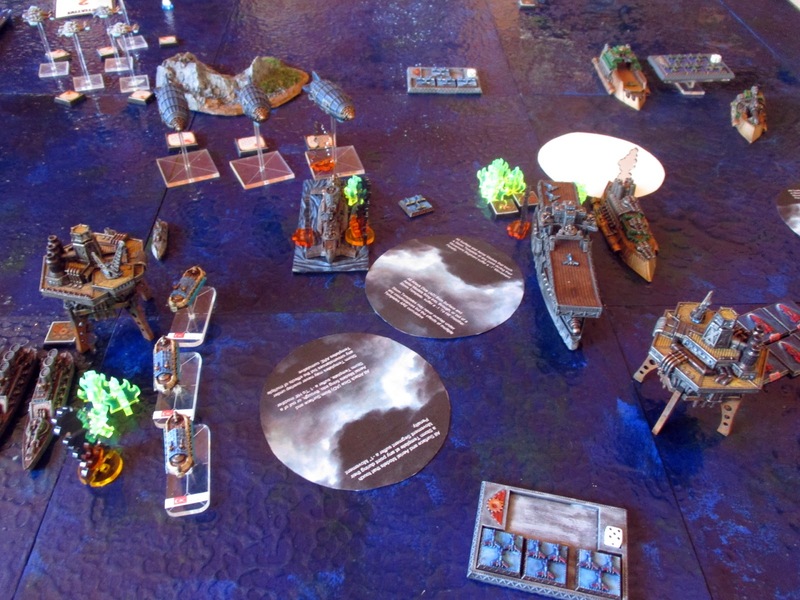 The Phoenician airships found themselves outgunned by a Nemesis battlecruiser and Avci destroyers, as two of the mercenary airships were brought down. Sensing the battle now hung in the balance the damaged Sadrazam battleship approached the research station and sent boarding parties aboard, knowing there was a 50% chance it was booby trapped. However, fortunes favoured the Ottomans and they recovered the Priceless artefact! 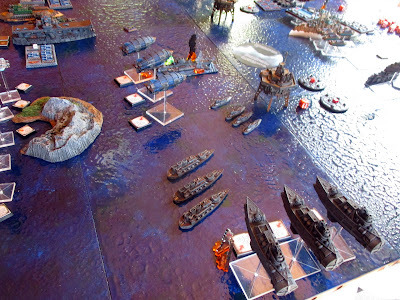 The corrosive munitions that had weakened the hull of the Sturmbringer, finally took their toll, sending the sub beneath the waves one final time. At the end of Turn 2 neither side had secured the necessary 50%; the Ottoman and Black Wolf had accrued 780 victory points (including 250 from event cards) and the Prussian and Raj had scored 655 (including 100 from event cards). As the Priceless Artefact had been recovered, one way or another the game would be decided in the next turn! 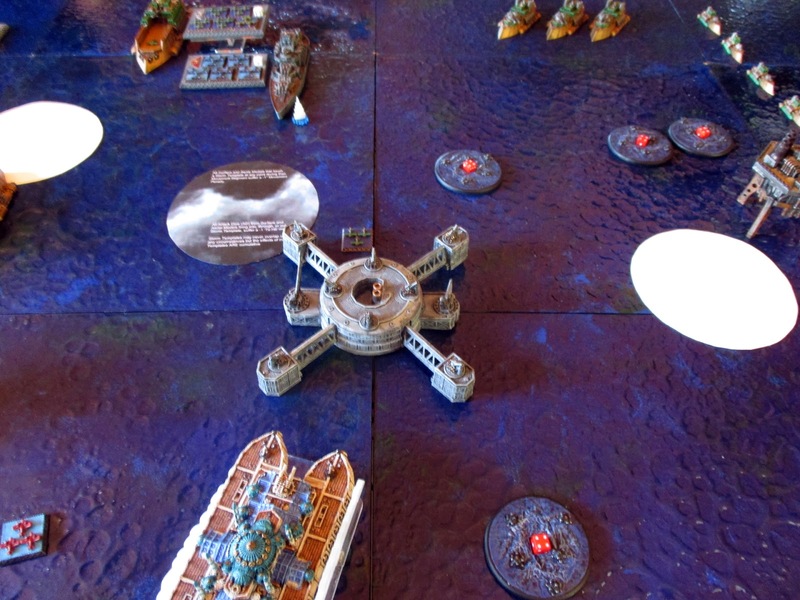 The Prussians now unleash a ferocious assault, destroying the fighters that protect the mighty Kanuni Dreadnought, before the Pflicht airships send wave after wave of marines aboard. The fighting was brutal, and although the Prussian losses were high (only 1 AP survived) they slew the royal guard and seized the mighty Ottoman flagship. Many in the Ottoman fleet were so dismayed by this loss they momentarily lost the will to fight. Ottoman losses were further compounded by the loss of the Sadrazam battleship to the combined fire of the Raj and Prussian heavy battleships. This loss was soon avenged. 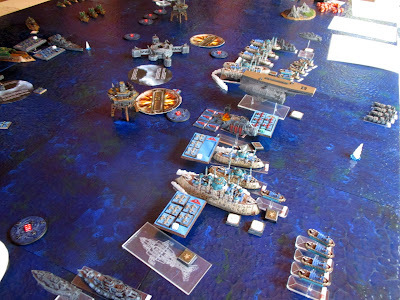 The Elbe, already damaged by close range fire, was destroyed in a brutal exchange of gunnery while the lumbering Black Wolf Retribution sky fortress destroyed the Chanura heavy battleship in a bombing run of devastating intensity. Both Commodores perished leaving several squadrons across both fleets in disorder. The final exchange of the battle occurred as the Nemesis and Avci destroyers mopped up the remaining Veran corvettes, while the Devak cruisers and remaining Phoenician airship picked off two Fettah cruisers. Final victory points were 1,550 for the Ottoman and Black Wolf (including 250 from event cards) and 1,500 for the Prussian and Indian Raj (including 100 from event cards). A victory for the Ottoman and Black Wolf, but by the thinnest of margins.